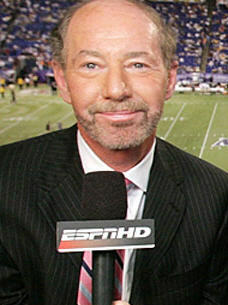 Tony Kornheiser has been suspended as host of ESPN's "Pardon the Interruption" for comments he made on his radio show last week about Hannah Storm's wardrobe, according to several media reports. Kornheiser apologized to Storm after making the remarks. An ESPN spokesman says he will be suspended "for some time," which is expected to translate into a few days. Kornheiser said Storm was wearing "a horrifying, horrifying outfit" and a "very, very tight shirt. "She looks like she has sausage casing wrapping around her upper body," he added. "I know she's very good, and I'm not supposed to be critical of ESPN people, so I won't ... but Hannah Storm ... come on now! Stop! What are you doing? ... She's what I would call a Holden Caulfield fantasy at this point." The columnist and broadcaster opened his radio show the next day by saying, "I apologize, unequivocally ... I'm a sarcastic, subversive guy ... I'm a troll, look at me. I have no right to insult what anybody looks like or what anybody wears. That, I think, should go without saying."